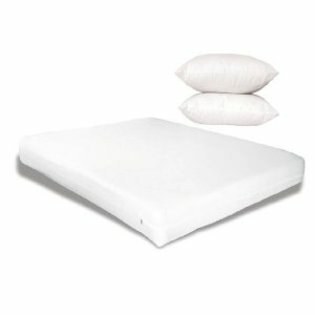 There is much confusion about the different types of allergen-proof pillow encasings and allergy mattress covers on the market today. There are three basic types of encasing: vinyl, polyurethane laminates, and microfiber. Vinyl is the most common and affordable mattress encasing available, however, it is also the most uncomfortable as it is often loud, hot, and hard. Most people will recommend using the vinyl encasing on your box spring. It is for this purpose that we offer the line of Vinyl boxspring encasings. These are considered the next best allergy bedding and can be found at any common department store at a reasonable price. This type of bedding is a fabric fused with plastic to make it stronger. Similarly to vinyl, it is somewhat stiff, which causes it to be uncomfortable. It is also nonporous so there is no breathability. The biggest issue with these encasings is that the plastic will often separate from the fabric, causing you to replace them fairly often. Microfiber encasings are the most expensive as they use the most up to date technology and fabrics to make them so high tech. They are the most comfortable, with great breathability, however, even with microfiber encasings, there are good and bad variations. Microfiber fabric must be about 2-6 microns large to efficiently block the allergens. Many encasings are around 10 microns large which will not block all allergens, causing the encasing to be less efficient. Allergy encasings come in many different fabrics, styles and sizes; the key is to do your research to see which one best fits your needs and lifestyle. Our Pristine® Basic line offers an economical way to provide microfiber-grade protection together with a comfortable environment. Our Pristine® PREMIUM line is made of the highest standard woven microfiber. It has a smoother texture and a smaller pore size than Pristine® Basic, offers the best possible protection and the ultimate in comfort. Our Pristine lines of Pristine Basic & Pristine PREMIUM microfiber encasings are essentially equal to what retail stores charge for generic laminate encasings. Our line of laminated encasings is essentially equal to what retail stores charge for generic vinyl encasings. Our encasings are the most effective, the most comfortable, and the most fairly priced. One last type of encasing fabric, the "non-woven", must be mentioned to make the story complete. An older example of a non-woven fabric is felt. This is made by gluing short pieces of yarn to each other to form a mass. This is in contrast to a woven fabric where the long warp and weft yarns are alternately woven above and below each other on a loom. Newer non-woven microfiber fabrics are effective and inexpensive allergen barriers, but they are not made to withstand machine washing, and they do not have the strength or durability of woven microfiber encasings. Not all encasings are equal! It is, of course, up to the individual to decide what they want to buy and what you are willing to spend. But if the above differences are understood, one will be in a position to make an informed decision.